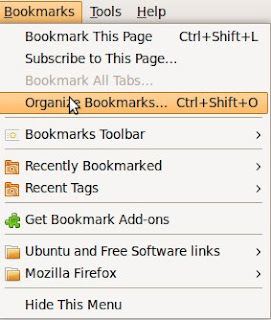 Have you ever had the need of having your Bookmarks in Delicious.com imported to Firefox so that you can browse through them easily from your address bar? Or do you ever needed an XML backup of all the Bookmarks you saved in Delicious? Safety first! You don't like to lose whole bunch of bookmarks collected for years get lost just because you forgot the password or the site is broken down, right? The main reason I wanted this is to import the bookmarks into my browser, Mozilla Firefox. So that I can pretty easily search through them by the enhanced address/location bar. Importing into Firefox is pretty much simple. You don't have to go through command line options. Here's how it is done. 1. Log in to Delicious and go to settings. 2. 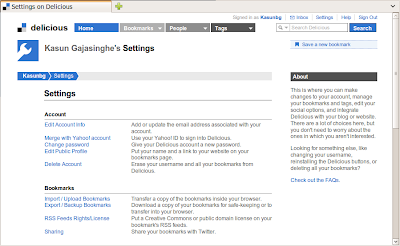 In it under Bookmarks section you can find Export/Backup Bookmarks. Click on it. 3. On the opened page, make sure you have checked "Include my tags" checkbox. Then Click on "Export". 6. Go to Import and Backup -> Import HTML on the opened dialogue box. 7. Then the Instructions are easy. Just follow the steps and give the file when asked to.